Do you know what a false prophet is? How would you recognize one if you saw one? Or heard one? Are they easily identified — or are they shrouded in obscurity? Are false prophets in the minority — or are they to be found in abundant supply? Does it pay to be a false prophet — and is there any future in it? SOME DEFINE "a false prophet" as any minister with whom THEY DO NOT AGREE! Simply because a man says something that sounds strange or different from the religious statements they are accustomed to hearing, does that make him a "false prophet"? To many it would. People have odd ways of evaluating a minister's authenticity! Some consider the size of a man's following as the measure of his worth. Others feel it is his personality or approach or appearance that identifies him as a true servant of God! Others still feel that a minister's credentials or the letters after his name or perhaps his linkage with the religious establishment is the crucial criterion. Yet, in plain point of fact, NONE of these "popular signs" is the sign of a true minister of God — if we are to judge using the Bible as our standard. Stop and ask yourself some candid questions. When Jesus was active in His ministry, did the religious establishment of the day accept Him? No! Christ was not endorsed by the local ministry as He preached the Gospel of the Kingdom of God in every town He visited. Just the opposite. They sought, and finally took, His LIFE! Nor did Christ teach the old established ideas that the people were accustomed to hearing. What He said astonished everyone! They realized He spoke with authority! Read it in your own Bible in Matthew 7:28-29. Jesus had no papers or credentials from any of the then-existing schools of theology. He was not a Pharisee, a Sadducee or an Essene! In fact, people wondered at His lack of credentials and questioned how He could preach with such authority and do such miracles! They pointed out that He was merely a carpenter's son (Matthew 13:54-57). His authority was constantly in question (Matthew 21:23 and Mark 11:28). Nor was Jesus Christ an outstanding man in appearance or stature — He was certainly not the movie-idol type. Isaiah described Jesus' appearance in chapter 53:2. Christ never stood out in a crowd and especially not because of His allegedly long hair! 'In fact, the Holy Spirit inspired Paul to write that it is a SHAME for a man to have long hair! (I Cor. 11:14) Surely we can see by now that a true prophet or minister of God is not measured by his appearance, following, credentials or his association with established religion! None of these things marks a man of God! One: A true minister of God must study, preach and live by EVERY word of God! If a man tells you something that he knows disagrees with God's revealed Word, he instantly disqualifies himself from being a true minister of Christ! Isaiah 8:20 and Matthew 4:4 confirm this! Two: A true minister must teach the SAME GOSPEL JESUS TAUGHT: The Gospel of the Kingdom of God. Of course he must teach repentance of sin, acceptance of the blood of Jesus Christ to atone for that repented sin. But more, he must teach the purpose of repentance, the purpose of Christ's shed blood: the eternal life God offers us in His Kingdom, His own Family, as His born Son, ruling with Him in God's Kingdom. Maybe you are thinking, "Well, surely there are very few ministers who would dare to deliberately twist God's Word and deceive people! Any ministers I know are sincere and honest. Fine men." And undoubtedly there are many very sincere men in the ministry! But it is possible to be sincere and yet also be very much deceived! It is entirely possible to be sincerely WRONG! You see, God did not say the false prophets would be in the minority! God tells us there will be MANY such individuals! "For MANY [not a small minority, but the MANY!) shall come in my name (claiming to represent Christ), saying, I [Jesus] am Christ [proclaiming Jesus of Nazareth as Savior and Messiah]; and shall DECEIVE MANY." So says your Bible in Matthew 24:5, 11! Here God shows us that vast numbers of people would be deceived by great numbers of false ministers who would falsely claim to represent Christ! In fact, God tells us that the whole world is being deceived! Read it yourself in Revelation 12:9. 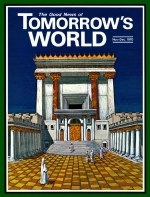 This magazine is called "TOMORROW'S WORLD." There is a REASON for that. We in this WORK are proclaiming a message about conditions on this earth in the world just around the corner — in tomorrow's world. We are preparing the way for the return of Jesus Christ, to take over the reigns of WORLD GOVERNMENT! Jesus will set up a system of government that will disseminate the Truth of God around this earth to the extent that it will saturate all the world like a giant ocean of priceless knowledge! (Isa. 11:9) In that world there will be no room for false prophets! Any such individuals who are fortunate enough to make the transition from this end-time age into the society of tomorrow will find themselves facing the task of learning a new profession! You might say the false prophets of today will be the FUTURE FARMERS OF TOMORROW! Notice how Zechariah describes the conditions of tomorrow's world! "And in that day the false prophets shall everyone be ashamed of his vision when he prophesies. No one will be boasting then of his prophetic gift! No one will wear prophet's clothes [men of 'the cloth'?] to try to fool the people then! No, he will say, I am not a prophet, I AM A FARMER..." (Zech. 13:4-5, Amplified and Living Prophecies versions). And so it will come to pass that this anecdote will come true: A young man once came to a true minister of God and said, "I had a dream last night and my future was made plain to me. In the sky appeared two great letters: 'PC'! And so I know that I must be a minister and Preach Christ!" But the minister answered the young man and said, "You may indeed have seen the great letters 'PC,' young man, but you gave them the wrong significance. For you 'PC' does not mean Preach Christ — it means Plow Corn, Pluck Chickens and Pick Cotton!" False prophets of today's world — PREPARE TO PLOW!